Bollywood actor Dharmendra (Dharmendra) has become eighty-three years old today. Dharmendra celebrated his 83rd birthday with Hema Malini and her daughters. Dharmendra's image is getting viral while cutting the cake with Hema Malini (Hema Malini) and Isha Deol. Not only this, Hema Malini has congratulated Dharmendra on her birthday in a very romantic way. Hema Malina's estimate is a huge hit on social media. 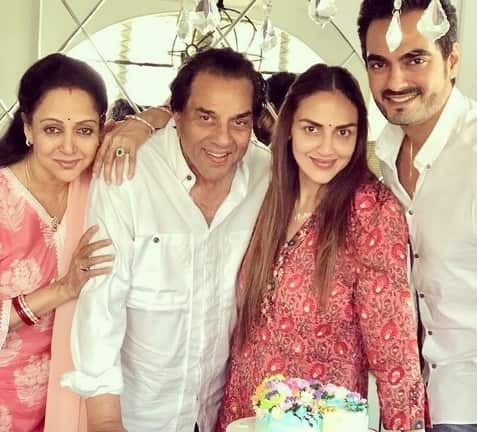 Hema Malini has greeted Dharmendra on Twitter on her birthday: "My eternal love, my dear daughter's dear father and Darien & Radhya great grandfather's birthday greetings. The fans who are sending me messages on Dharamji's birthday are thankful to him and I will definitely convey his good wishes to Dharamji. " Dharmendra and Hema Malini have collaborated in many films like 'Raja Jani', 'Sita and Geeta', 'Sharaafat', 'Sholay' and 'Naya Jamana'. Their two daughters are Isha and Ahana. Isha also congratulated her father on the birthday of his father on social media. He shared a picture of Dharmendra's birthday, "Happy Birthday Papa." In this picture, Dharmendra, Hema, Isha and her husband Bharat Takhani are smiling. Dharmendra was born on December 8, 1983, in Nasrali village of Ludhiana district of Punjab. Dharmendra's real name is Dharam Singh Deol. Dharmendra's childhood passed through Sahnewal and he studied at Government School in Ludhiana. His father was a school headmaster. Dharmendra's life changed when he filmed Filmfare for the movie. These advertisements were given by Bimal Roy and Guru Dutt. Dharmendra was the winner of New Talent Hunts and reached Punjab from Mumbai. He was very laborious and talented since childhood. So, many stories are available from his childhood.